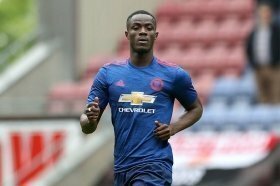 Manchester United have been handed another potential injury blow with Eric Bailly taken off the field during an African Cup of Nations qualifier for the Ivory Coast. The 24-year-old clashed heads with an opposition player during the second half of his side's 3-0 win over Rwanda at the weekend and he was taken off as a precaution shortly after. According to The Mirror, the central defender is now set to return to familiar surroundings in Manchester with the Ivory Coast not featuring again during the international break. Still, there remain concerns whether he would recover in time for the Premier League meeting against Watford which is scheduled at Old Trafford at the end of the week. United have already witnessed a few injury setbacks during the international break and they are presently without the likes of Anthony Martial, Luke Shaw, Nemanja Matic, Marcus Rashford, Romelu Lukaku, Alexis Sanchez and Matteo Darmian. Ole's team are currently on a two-match losing streak across all competitions and the Norwegian will be aiming to return to winning ways against the Hornets this weekend.